This is a very image-heavy post. And quite lengthy as well. Please come back later if you’re busy. 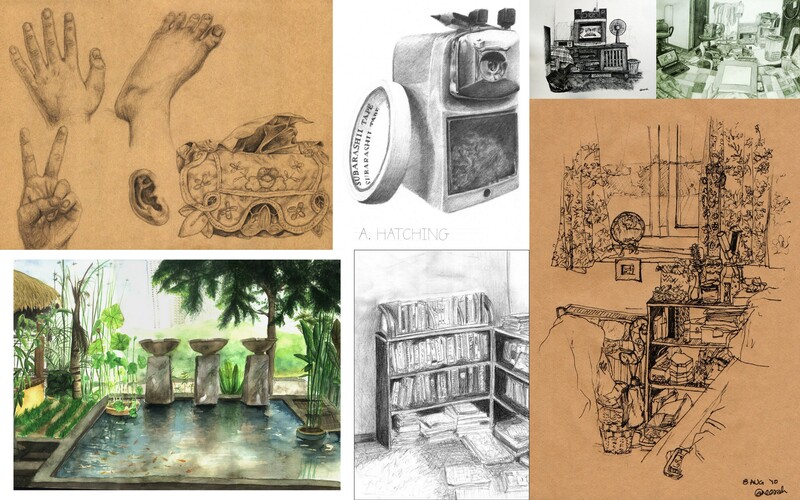 I think this entry is mainly for myself, because I felt like collecting my “art”work and looking back and analysing a little bit. 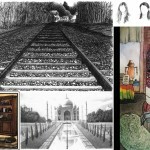 This started when I read Michele’s blog entry about finding her drawing “style”. (She is mainly a crafter, and an awesome one at that! ) I’ve always been struggling with finding not only my art style, but genre, niche and media! When I was younger, I tried almost everything (art/craft-related). I just wanted to learn, and wanted to find out what I liked. Drawn when I was … 14. Gosh. This was an exception to the dad-helping-me case. It was a candyland theme that I painted digitally to practice. Unfortunately I don’t have the real painting that I did for the exam. Another confession — Harry Potter made me take up drawing as a hobby. 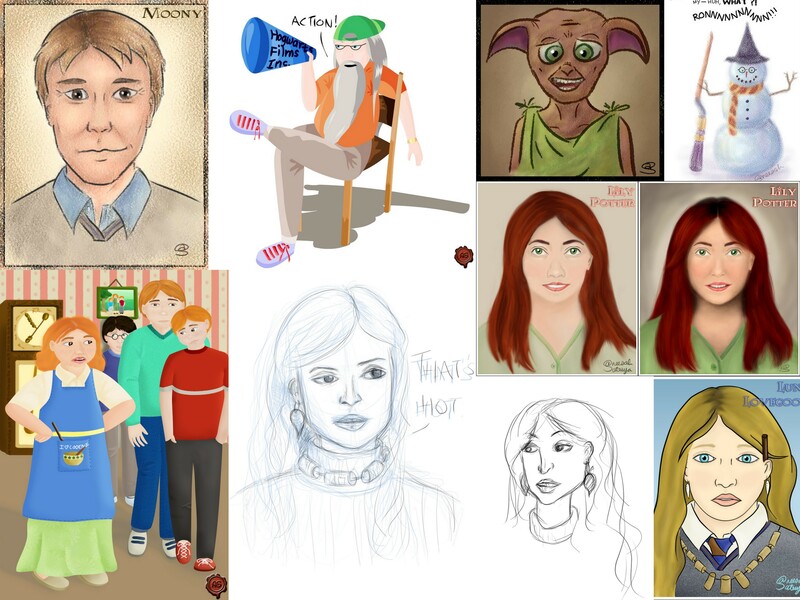 I was a huge fan of the books, discovered something called fan art, did my own fan art, and from there I learned to draw in MS Paint (sadly I cannot find those drawings anymore), followed by Adobe Photoshop, and Macromedia (now Adobe) Flash and Corel Painter. 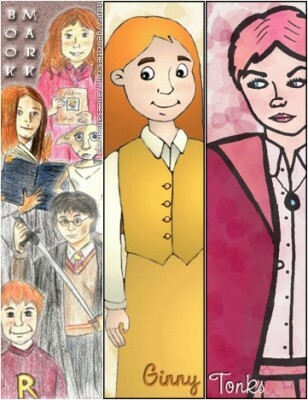 Oh, Harry Potter also made me discover webdesign because I made a website to display my fan art. Hiks. This was around 2003 up till 2005-ish. 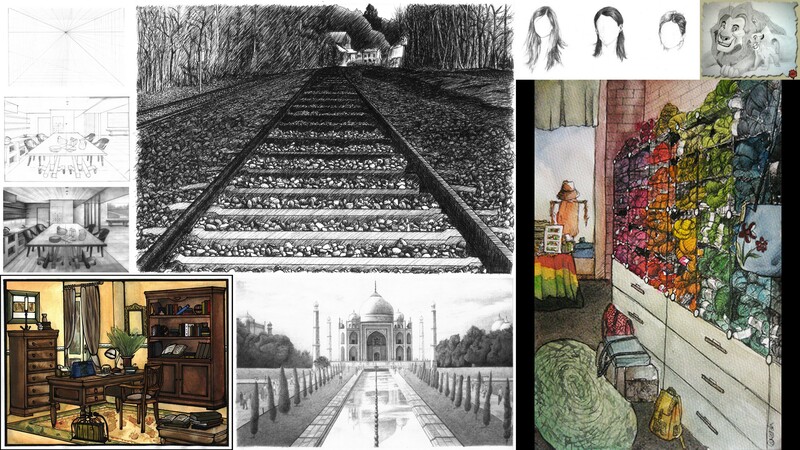 I started with traditional media (leftmost image), and drew based on existing illustrations. Then I started drawing from imagination, and coloured them digitally. With drawings that were from my head, I was always bad at anatomy and perspective and composition and all that. And I never improved much because I stopped trying. There are really no shortcuts with this but to learn the basics of human anatomy (how your arm muscles work) and proportions (how long is a torso in comparison to a head), and then building the drawing from a skeleton/bubbles, etc. I instead turned to portraits (which doesn’t require much knowledge of anatomy ) and drawing from photo references (which remains an area of heavy debate, eg. “that’s not real art!”). I’ve read that the only exception to the rule of drawing from the inside out is drawing comics and maybe manga. I guess again, it depends on your style. Cartoony drawings or simple styles may look like they don’t require much sketching beforehand, but they still require a lot of skill. 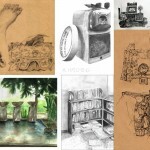 The ability to “see” what you imagine and transferring the image onto paper in the way that you want it, is generally not acquired without practice. Oh, I should mention that at some point (2004), I got myself my dad got me a Wacom tablet. It is a Graphire3 model, and I say “is” because it still works today, albeit the pen sensitivity may be a little off. Digital fan art from imagination. I was one of those fans who disapproved of much of the movie cast, because the actors looked nothing like the characters in my head. >_< Oh, and I’ve always liked Luna, that’s why there are three versions of her up there. The mash-up of traditional and digital media continued. 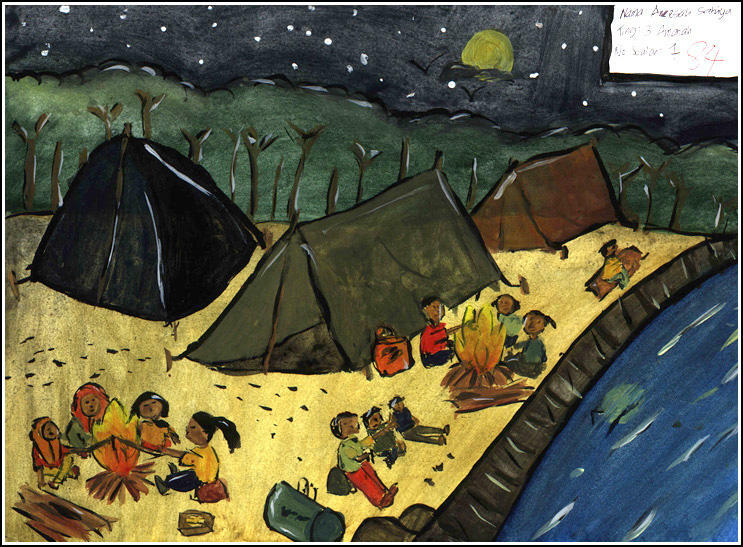 Top: digital sketch of a scene. Apparently the computer crashed afterwards and I did not bother colouring it again on the computer. So I drew it on blue cardboard instead and used coloured pencils. Painting from photo references is, honestly, for me, quite easy. Far easier than what real illustrators do (having to compose scenes from scratch). These were all done in Photoshop except for the Percy Weasley one, which was Corel Painter. GIF animation of a digital portrait. 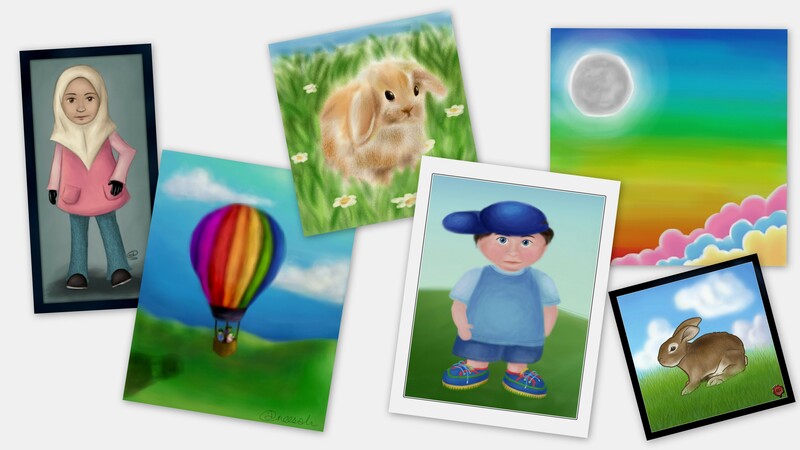 I used grids (not shown) to “copy” the photo onto the canvas, then shaded and edited by eye. Miscellaneous digital art, some done in oekakis (online painting tools), others in Photoshop. Traditional pencil/pen portraits. 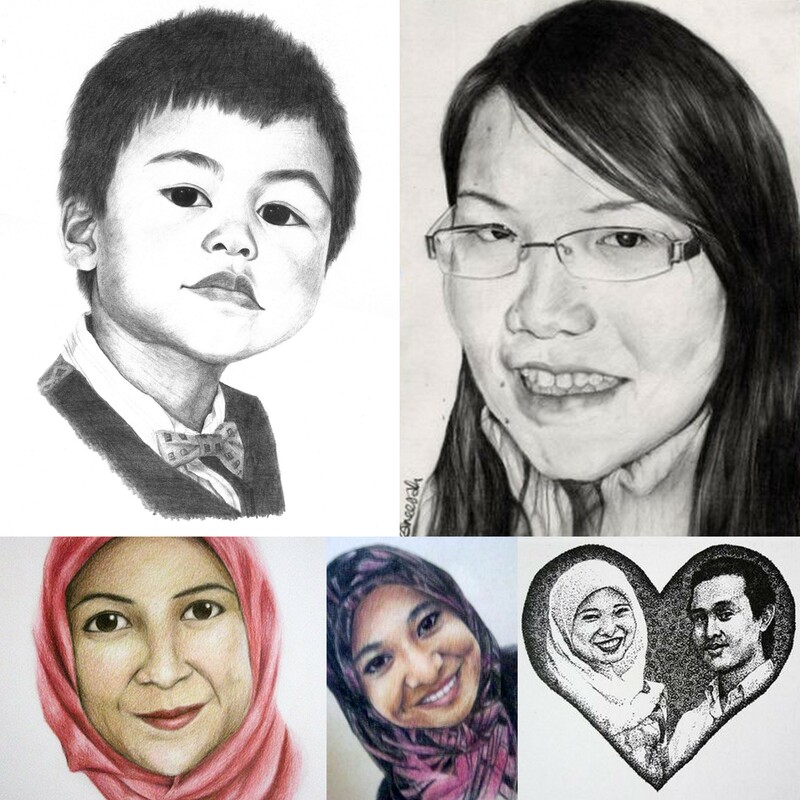 All drawn as gifts except for the lil’ boy (my brother), which was an art class assignment. Another progress animation. This lady was actually my art lecturer, hee. I believe that the main missing piece in my “artworks” after my fan art phase was that I had nothing to say. I was not one of those who used art to express themselves, nor did I have some kind of message or cause that I promoted, I even liked too many different kinds of art and didn’t stick to just one. I followed loads of Photoshop/Painter tutorials (oh here’s a fuzzy bunny painting I found) and didn’t know what to do with the result. Basically I enjoyed the journey/process but didn’t care much about the destination? I suppose that might be why some people become d e s i g n e r s, not a r t i s t s.
Well I’m now a trainee architect slash crafter slash note doodler, and still … not quite an artist. Eheh. 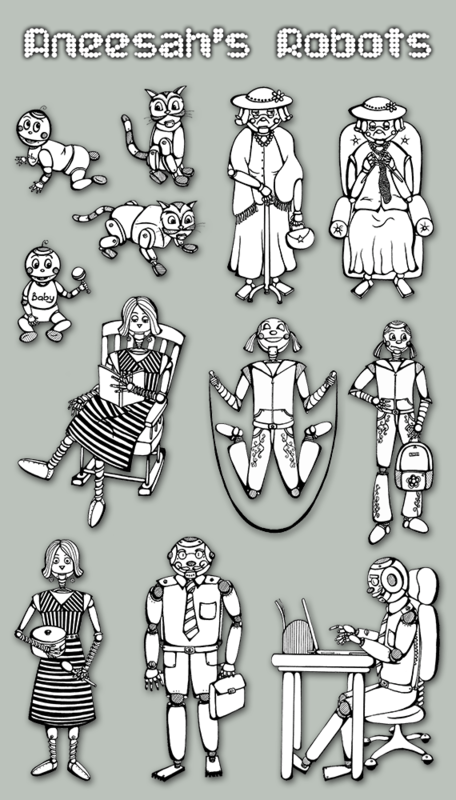 The entire robot family. Inked in black pen & scanned. 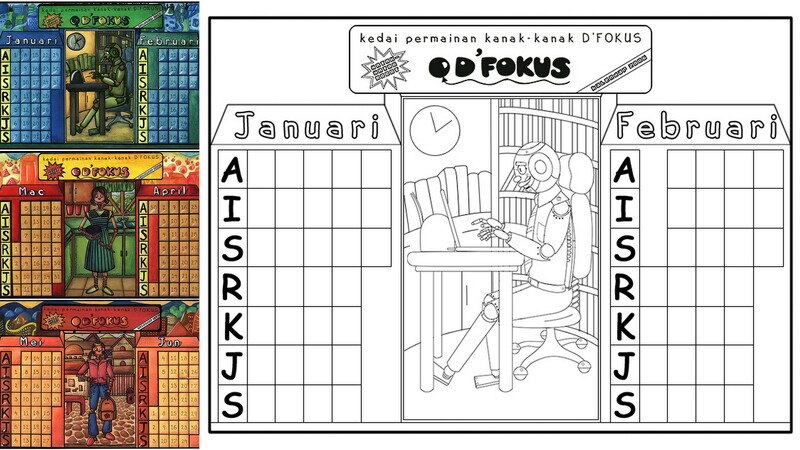 These robots were for my SPM Visual Art project: a desk calendar design for a toy store. I didn’t even remember that I used digital means to help with the process. After sketching in pencil, I scanned the characters in, inked in Flash, and experimented with colour in Flash too. I quite miss using Flash — it’s very good for getting smooth clean outlines since it is a vector-based program (like Adobe Illustrator). This is either bordering on plagiarism or absolutely plagiarism, but forgive me please. 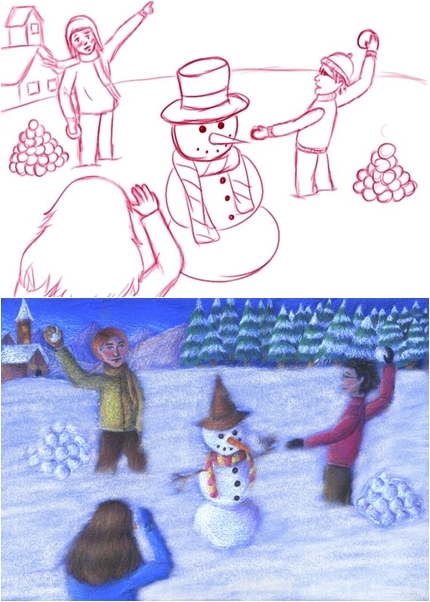 The leftmost image was googled, redrawn in Flash (middle image), then coloured in Photoshop (right). This was supposed to show the finished calendar in use. 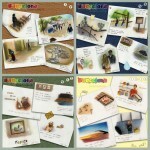 And these are some of the calendar pages. Again, “cheated” by drawing out the layout in Photoshop. 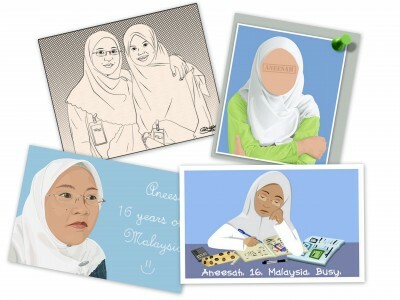 Printed, traced with pen using lightbox, coloured with watercolour pencils. Perhaps part of why I used the computer with so many of my artworks was that it’s cheap. _ Hello, have you seen the prices of nice quality paper and artists’ paint? Not to mention the whole drawing-a-straight-line, moving-things-around, typing-text-with-proper-fonts aspect of it all. It was convenient and I could use it, so I used it. Just to display more variety of the styles I tried, this is vector (or vexel) art. 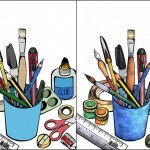 Using the Pen Tool in Photoshop, except for the top right drawing which was done in Illustrator. 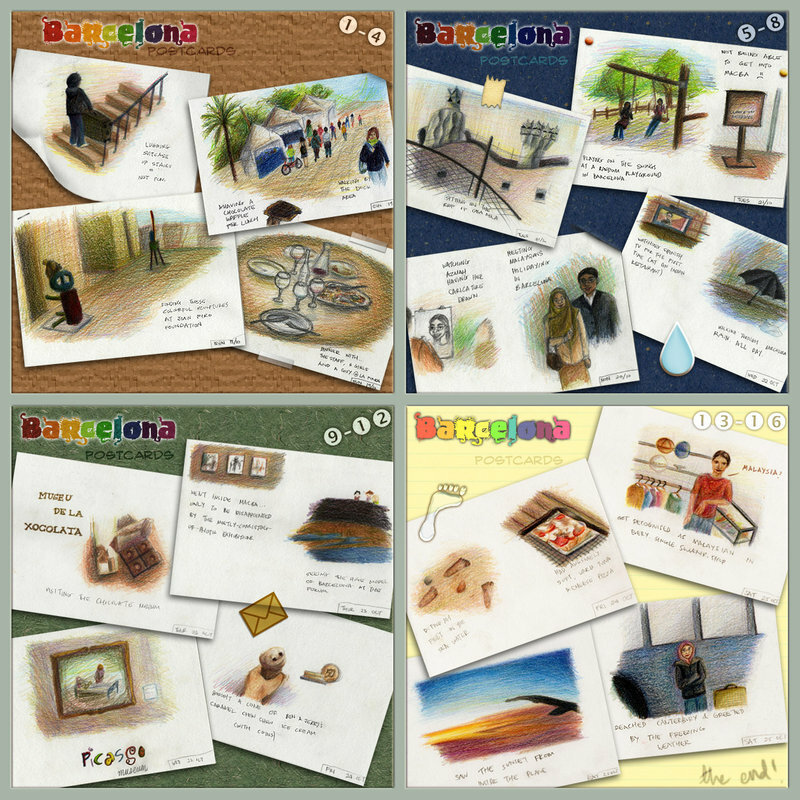 And all were based on photographs except for the bottom right. And the following are examples of pixel art I did. Pieces drawn pixel-by-pixel, traditionally related to certain styles of video games (I think). The blue teddy bear was even based on a real one I had. Below are some more of my traditional work, which I shall not elaborate on because this entry is getting looooong. All done in Photoshop, some from photo references. As you may notice, there is a drastic reduction in the number & choice of colours used. This is because 1) in architectural graphics, everything, including colour, needs to have a reason for it. And 2) my tutor always had a major problem with my choice of colours. (I am a big fan of colours and colouring.) And by major, I mean she would mention it in every single tutorial. There is a point to all of my stories above. As I’ve previously mentioned, my new “thing” is coming up with visual notes. This was an accidental venture, but I’ve also done it for Konvensyen Bidadari Dunia (except I haven’t finished editing/uploading all my pages because I is slowww ), and now alhamdulillah I am also drawing monthly doodles for Productive Muslim, based on their existing content. What software did you use to do the doodles? 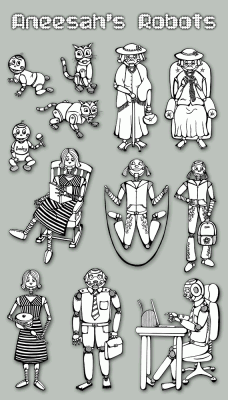 Some of the tiny doodles I extracted from my notes. Glad to say there is a consistent style going on, at least a little bit. but really — I think it’s not just having “talent”, it’s all my previous experiments and trials and errors and trying to find my “style”, coming out. I’ve now kind of found one (because you can tell that it’s the same person who drew the doodles, riiight? 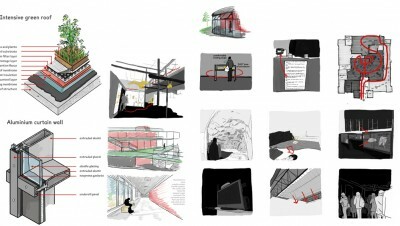 ), although I still have to resort to Google Images to help me draw hands, or a tomato-shaped kitchen timer , but still — I’m sure even my architecture degree and the picky tutor had something to do with what I am able to do now. Alhamdulillah. So I am not regretful that I did not turn out to be some kind of professional artist or illustrator — those years of experience must’ve given me something after all, even if I or anybody else can’t pinpoint it. God always knows best. I pray that each of us are able to use whatever we have for good causes. Ameen. Goodnight everyone! Very good point! Wa feeki ya ukhti! 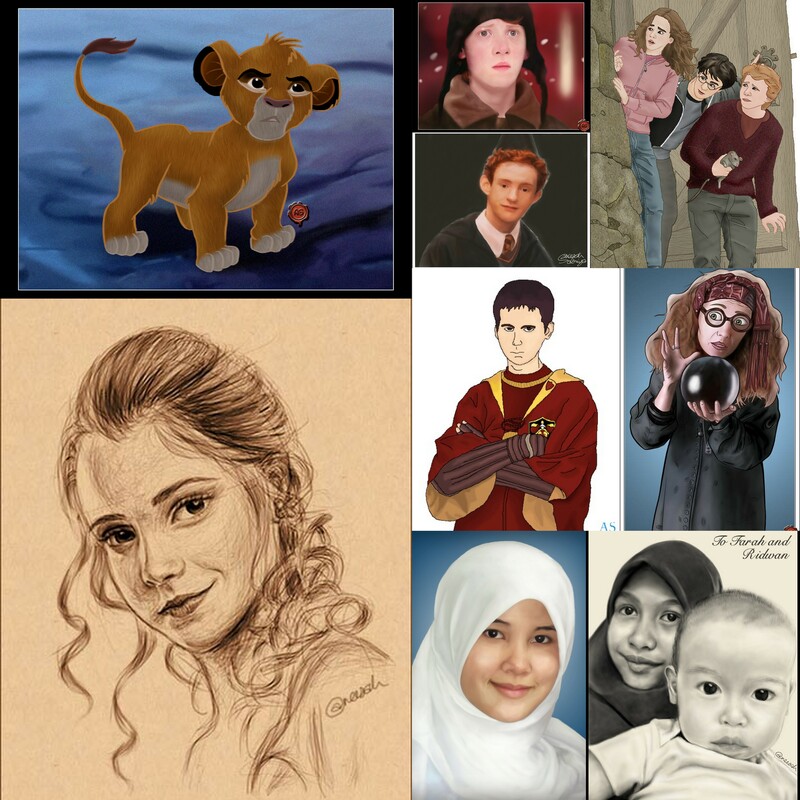 yang emma watson tu semua, u drew them all in photoshop? with wacom? wey gila la im impress gila kot! Ye Kak Noe, hehe. Like I said, entah kenapa realism comes easier to me than other styles. Tapi kalau nak lukis without reference memang agak hampeh lah. again, very inspiring. ALLAH always knows best. May our talents worth for Ummah. insyaAllah.